Georg Wilhelm Friedrich Hegel was a German-Prussian romantic in the sense that he saw the finite man as an element that moves toward the infinite. To him self-consciousness comes from thoughts thinking about themselves and this becomes a path to Absolute Knowledge. Absolute Knowledge is the highest form of spirit as a free thinking and logical rationality. Society is seen as pushing people closer and closer to the development of an ideal where thoughts and reality are intertwined. Understanding history helps mankind to understand the overall development of society and governmental systems as synonymous with the development of the freedom of spirit. 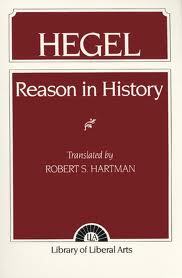 Hegel discussed three analytical approaches to understanding history in his work Reason in History. His argument is that history can be seen as original history, reflective history, and philosophical history. Each provides a different vantage point and way to look at historically significant events. Original History: The unadulterated history as offered in manuscripts, facts, etc… of the time. Reflective History: Reflective thought and interpretation of history. Philosophical History: Using philosophy to see events as a path to development. The author argues that all actions within the world are based upon reason. It was reason that caused the events and it is reason in which they are interpreted. Even the plans of God should be interpreted through the philosophy of development and reason. The only true form of freedom that people can realize is the freedom of spirit. As human actions and passion are subjective experiences they can be interpreted in many different ways. Yet as these passions and actions mesh with underlying principles (truths) the true freedom of spirit comes to know itself and become aware of its existence. The spirit can realize itself within the State. The State is the governmental and cultural systems of people. The State is a material aspect in which the spirit comes to actualize itself in varying forms. The historical development of people is based within the development of the state through the course of history. As the spirit changes so will the state or that state will decline as it no longer manifests the development of spirit. Human kind is on a continually path to realize its spirit in self-conscious, rational freedom. Societies may come and go but all will be subject to the manifestation of spirit. To look and analyze history is the same as analyzing the development of citizens and their spirit. Where humans are not developing the nature of the state begins to decline. If we look at places in the world that are suffering under the weight of their own existence we may come to find that true development of the inhabitants is generally lacking. Using Hegel’s philosophical framework it is possible to see that a contained spirit is one that is not manifesting itself into higher states of existence. The development of society and the human spirit is also the development of the innovative and economic development of an area. Societies that allow thoughts, words, and constructive actions to flow freely are also likely to develop economically and socially. Those that are bent on control or subjugation are likely to decline and suffer the weight of impoverishment. Thus, the thoughts and actions of leaders impact the lives of their followers and this can only change through environmental forces or the forces from within people themselves. History determines the success of all social experiments.